Misha tells time by when she gets fed. In the morning she goes out, does her business, and gets breakfast. Time to wake up from her nap because Grandma is having lunch. She goes on her walk around noon and gets a snack. 3pm she gets some vegetables when I make lunch and Grandma has dinner. Then, it’s “bum a few pieces of rice cake” at 4, eat dinner at 4:45, and try to steal some Cheerios at 5pm. That’s how her day goes. She know each item in order and if you veer from the appointed schedule she will not let you forget. Here she is trying to hard to stay away because her Grandma is taking a shower. She know that after she is done she always has Rice Chex or crackers. She must stay awake until that happens. She’ll wait here pretending to sleep until the bathroom door opens. Then, she will not rest until that snack happens. 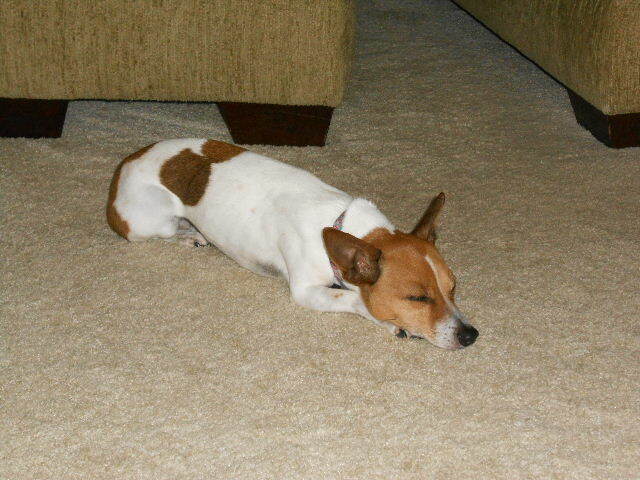 It’s so hard for a Jack Russell to stay on top of things. Misha waiting for her evening snack.